Spring Break in South Florida is a great time for vacationers — there are so many things to see and do. One very popular attraction is a tour of the Everglades on an airboat. The advertisements for these tours are very enticing – getting to see alligators up close and personal while exploring the Everglades’ wide variety of plants, trees and wildlife. The tours are also advertised as safe enough for pregnant women and infants. While these tours may be fun and interesting, they can also be very, very dangerous. During Spring Break 2015, A.M. took his wife and 3 minor children on an airboat tour of the Everglades. Upon boarding the airboat, A.M. and his family were greeted by a person who appeared to be a professional boat captain. They left on their tour around lunchtime. 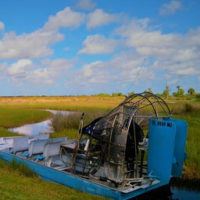 Approximately 1 hour into the tour, as their tour boat was traveling down an airboat trail, they were confronted by a second airboat traveling in the opposite direction on the same trail. Neither boat operator took appropriate action to avoid one another. As a result, the boats collided, causing A.M.’s minor daughter to sustain facial lacerations requiring plastic surgery. PWD filed suit against both boat operators and after 1 year of intense litigation, the case was resolved for a substantial, six figure settlement. Today, the attorneys at PWD are assisting Florida lawmakers in drafting new laws geared towards making the airboat tour industry safer for consumers.